Two people have been killed in separate road crashes. 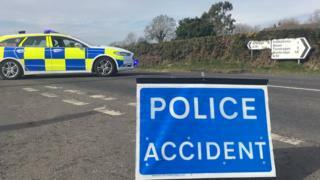 In County Armagh, a nine-year-old girl was killed in a crash on the Hamiltonsbawn Road between Hamiltonsbawn and Armagh on Monday morning. DUP MLA William Irwin said it was a "truly awful tragedy". "I know many people in the community will be thinking and praying for the family involved," he said. "They will need much support and prayer in the days, weeks and months ahead. I just can't comprehend that a young girl in her prime of life has been taken in this tragic accident. "My thoughts are also with the driver of the vehicle who I understand is recovering after this accident," added Mr Irwin. Meanwhile, a pedestrian in his 30s has died after he was hit by a car in Coleraine, County Londonderry. The incident happened on Quilly Road in the town shortly before 19:00 GMT on Sunday. On Monday morning the PSNI confirmed the man had died. Quilly Road was closed following the incident but reopened on Monday morning. Sinn Féin MLA Caoimhe Archibald said the local community is "shocked". "Any death on our roads is one too many," she said. "Our thoughts and prayers are with this man's family and friends at this sad and difficult time."